Light or heavy, short or long, metal or carbon fibre? Endpins can have a dramatic effect on sound, so it’s important to make careful choices. ARIANE TODES talks to five cellists about their endpin experiments. I have tried angled, Tortelier-type endpins, sometimes for years at a time, but have come to the conclusion that they are not for me, and now I use a straight one. Some long-legged people prefer bent pins, and they are similar to the long, straight kind in function, but the angle and the way you tilt the cello are a little different. Straight ones are more practical, as they allow you to stand the cello next to you when standing up, and they have a simpler construction and less weight. I have researched the history of endpins and how they developed, and I always remember the fact that players used to perform perfectly well without them. I talked to Anner Bylsma, who reckons the first ever endpin was very short because players held the instrument low on their calves when fitting them, but that eventually endpins started to be longer. Playing without an endpin helps one understand the purpose of it, what it offers that would otherwise not be possible. The main criterion for me is what it’s going to do for my posture. For many of us the endpin is a curse, not a help: when cellists played without, they were much more flexible with their cello position and more active with their bodies. 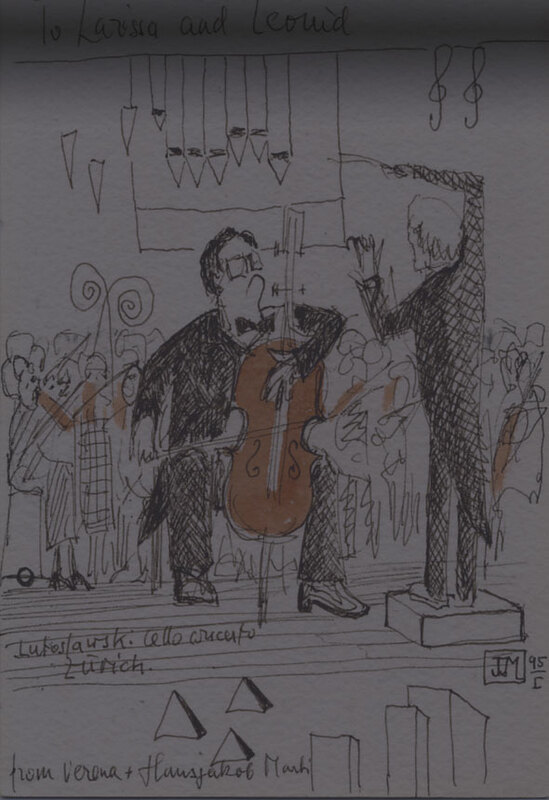 The cello was not a rigid object – it could move very easily. I haven’t yet met a Baroque player who has back problems, but cellists who use endpins, do, because of the rigidity. Of course, endpins have made it easier to sit for longer periods, making our lives easier, but they’ve also made us more lazy. Without an endpin you can adjust the angle of the cello in many ways. Not just laterally, but also from left to right, and forwards if you want to get to higher positions. Cellists often reach their shoulders over the cello: this looks dreadful. You only have to move the cello slightly forward to be able to reach anywhere. It’s easier to understand these little movements when you have tried playing without an endpin. There are various schools of thought about the material of endpins. Most people I’ve met say less weight is better than more. There are special endpins made of very heavy steel that are supposed to be better for vibration naturally, so I prefer a lighter endpin and tailpiece. I quite like carbon fibre, because it offers rigidity and doesn’t create extra noise as it’s stiff and incredibly light. The shorter endpin used by Piatigorsky, Feuermann, Fournier and Shafran gives players a very upright, dignified posture – that’s my idea of what cello paying should look like. I don’t want to be dogmatic, though: everyone should make a conscious decision about how they hold a cello and why, whether their body is free enough, and whether the endpin is an impediment in any way. POPPER’S BOOK is all about elegance, economy and legato. It helps you find efficiency, continuous movement and versatility. My favourite is the first etude, which covers all the possible string-crossing combinations – including those that are awkward or extreme. If you follow Popper’s instructions carefully you will learn to use your right arm in a versatile way, using the upper part for the big movements and the wrists for the small. The whole study should be played with a light spiccato stroke and a lot of the crossings are simply impossible if you don’t follow the given directions. The study is also a great tool for fingerboard navigation. During the string-crossings, the left hand does a lot of shifting, and some of the intervals are very large. To cope with this I aim to get students to play the etude with very still elbows, and help them to find the best position for both arms. If you have to use your elbow to jump around the cello’s fingerboard, the instrument can seem very long, but if you find a good position for the left elbow, where your hand can reach either extremity very quickly, it becomes manageable. I ask all my new college students to play no.1 so I can explain my views on the use of the arms. It can be played before then if the player is comfortable with the upper positions and if their thumb doesn’t collapse in thumb position. The Grützmacher étude is a favourite because it really sets up the left hand in thumb position. you play two pages in one position and he does not allow you to collapse your thumb or press too hard – you have to keep your hand rounded. The étude also makes the seemingly impossible possible. He asks players, for example, to play a major 3rd between the third and fourth fingers. It seems incredibly awkward, but once you learn how adaptable and flexible your hands are, it’s possible. Meeting Nikolai was like finding an island of home in a big new world. It was 1991 and I had just arrived from Russia to teach at the Menuhin School. Nikolai had already been teaching at the school for a few months and we quickly became friends. Not long after we met I bought my first car, but I hit problems with it almost immediately. Nikolai came straight round to my place, rolled up his sleeves and prised the head off the cylinder block, getting up to his elbows in oil, even though the next day he had a very important concert at the Queen Elizabeth Hall in London. We started playing as a duo about seven years ago. Playing with Nikolai is a liberating experience. His passion for music is fresh and intense, undimmed by his non-stop performing career. I find this quality very endearing and encouraging. He will always give a stunning performance, even if he is tired or unwell, or if the piano or the acoustics are not good. Being in the presence of a musician of such power means that normal preoccupations don’t surface. The musical goal is all-consuming and there is no time to think of anything else. Nikolai can pretty much take a piano apart and put it back together again, like a car engine. He is very interested in piano design and always tries to get hold of one particular model when we are playing together, because its singing quality blends so well with the cello. I never feel threatened by Nikolai’s sound, no matter what piano he is playing. His sound is incredibly powerful but is never harsh or muddy. When we play the Rachmaninoff Sonata I feel liberated by the clarity and strength of his playing – I open my chest and the sound of my cello goes flying. One season we performed a series of concerts with slightly varying programmes. At one of these concerts, which took place in the late morning, we finished playing our first piece, looked at each other and I started to make a big, swooping movement with my bow to begin the Rachmaninoff Sonata. But when my bow was a few inches from the sting, I heard Nikolai play the opening quavers of the Shostakovich Sonata! So off I went with the Shostakovich – carrying on as if nothing had happened. When I told Nikolai afterwards he was very amused. When you make music in a duo, it’s absolutely essential that you get on well. Leonid and I were friends for years before we started playing together. I really like Leonid’s personality and the way he plays, but the real reason that we started our duo is because we have one particular thing in common – music comes first over everything else. We argue quite a lot because we think differently, and somehow we have to reach an agreement about the music. Leonid is a very stubborn person and I think stubbornness is proportional to the amount of musical talent one has. I am very stubborn as well – so we have to take it in turns to compromise this way or that. It helps that we are both Russian as it’s always easier to express yourself in your native language. There are so many things in music that can hardly be expressed in words, and if you then try to put them into a language that is not your mother tongue, you will probably not succeed. We don’t have as much time to see each other as we would like, but we meet as often as we can. We have many interests outside music: literature, cars, technology and the internet – boys’ toys. Leonid has a witty sense of humour, sometimes acidic, but always very individual and funny. When we get together to work we do share some jokes, but usually we try to be quite serious when we are rehearsing because we want to perform at our best. Leonid is always trying new bows and strings – he is almost as much of a hypochondriac as many singers. He can be very sensitive, though he doesn’t let it show. Technically he is one of the most effortless cellists around – he can do absolutely anything – but what I most value is that his personality comes through the playing. He has his own personal voice on the cello and he really has something to say. Our partnership works well because our characters complement one another. Over the years we have developed a common voice in our performance, making the cello and piano match. This was an important issue when we made our Schubert CD; I wanted to make sure that our sounds were balanced on the recording and we had to persuade the producer to listen to our point of view, but eventually we managed to get the recording sounding the way we wanted it. What have I learned from Leonid? I can’t put it into words. It’s like love; it’s a natural and very powerful part of life. I really enjoy and cherish this partnership. Am Samstagabend gab er mit der Tübinger Pianistin Sachi Nagaki ein Konzert in Bebenhausen, von dem die Zuhörer noch Tage später schwärmten. Am Sonntag hielt der russische Cellist Leonid Gorokhov in der Tübinger Musikschul-Aula einen Meisterkurs, der diesen Namen mehr als verdiente. Organisiert wurde der Kurs in Zusammenarbeit mit dem Tübinger Tonkünstlerverband von Nagaki und ihrem Mann, dem Pianisten Jean-Christophe Schwerteck. Die vier Teilnehmer waren allesamt Bundespreisträger bei Jugend musiziert. Mancher sogenannte Meisterkurs dreht sich mehr um den Meister als um die Teilnehmer. Je grösser das Publikum, umso stärker drängen Selbstinszenierung und Privatideologien in den Vordergrund. Der Unterhaltungswert ihrer “öffentlichen Hinrichtungen” war fürs Auditorium hoch, wenn eine Elisabeth Schwarzkopf Schüler gleich nach den ersten Tönen unterbrach, ungnädig abstrafte. Sehr didaktisch dürfte es allerdings nicht gewesen sein. Leonid Gorokhov dagegen nahm sich ganz zurück, sass entspannt, aber hochkonzentriert da, das Cello vor sich, hörte erst einmal zu. “Soll ich das ganze Stück spielen?” fragte mancher Schüler nach. Selbstverständlich ist das nicht. Um seine Person macht der 1967 geborene Russe, der mit den berühmtesten Dirigenten aufgetreten ist, wenig Aufhebens. In der Pause interessiert er sich vielmehr für die russischen Autoren auf dem Bücherfest, erzählt, dass er manches von Vladimir Sorokin lieber nicht gelesen hätte: So viel Gewalt, die Bilder bekäme er nie wieder aus dem Kopf. Den Kurs hielt Gorokhov auf Deutsch, in einer bildhaft metaphorischen, fast philosophischen Sprache. Zielsicher diagnostizierte er das Kernproblem, hatte gleich Lösungen im Blick, blieb beharrlich, auch wenn es mehrere Anläufe und etwas mehr Zeit brauchte. Es war nicht das kurzweilige “Hier ein bisschen, da ein bisschen”, das man aus pointenreichen Schaukursen gewöhnt ist. Es war richtige Arbeit. Die Zuhörer nahmen an einem Erkenntnisprozess teil. Die 16-jährige Ophelia Koller, Schülerin von Joseph Hasten, stellte sich mit dem Kopfsatz aus Schostakowitschs Cello-Sonate op.40 vor, am Klavier begleitet von Michael Schwerteck. Gorokhovs Lob bricht gleich das Eis: “Sie spielen so aufregend, mit soviel Ausdruck und dabei so klar profiliert!” Aber er hat auch sofort die entscheidende Aufgabe für sie parat. Fast klingt sie wie ein buddhistisches Mantra: “Sie müssen wollen, dass was passiert.” Hier geht es nicht um Technik oder Interpretation: Es geht um “Entscheidungen im Kopf”, die Klang werden. Der Harmoniewechsel im Klavier schlägt sich auch in der scheinbar unabhängigen Cellolinie nieder: “Das müssen Sie wünschen, das ist wie eine Erlösung. Das darf nicht so einfach, wie automatisch kommen. Sie müssen den Hörer darauf warten lassen.” Die Aufgabe ist der Schlüssel zu anderen Stellen: So ist der Lagenwechsel ein paar Takte weiter keine abstrakte Abwärtsbewegung, sondern eine “herbeigesehnte Entspannung”. “Was wünschen Sie jetzt, von genau dieser Note? Das drängt, das will weiter.” Wenn Gorokhov eine Phrase vorspielt – mit kräftigem, leidenschaftlich geschwelltem Klang -, hört man, wie die Töne zu sprechen beginnen. “Ich möchte, dass Sie deutlicher sprechen. Dass sie die Linie als deutliche Frage formulieren”. Vorbildliche Haltung, richtiger Ton: Leonid Gorokhov zeigt Jakob Schall, dem 2. Bundespreisträger “Jugend musiziert”, wie man den Bogen raus hat. Matthijs Gawehn trifft gekonnt den fantasierenden Gestus von Gaspar Cassadós Suite für Cello solo. “Sie haben ein sehr gutes Gefühl für diese Stück”, lobt Gorokhov den 18-jährigen Schüler von Ulrich Schneider. Und er hat auch gleich eine Idee, woran Gawehn arbeiten muss: an seiner “Beziehung zur Saite”. Ursprünglich wurden alle Saiteninstrumente gezupft, der Bogen ist nur ein “Übersetzer”, ein Verstärker für den Klang, erklärt Gorokhov. Er lässt Gawehn ganze Passagen zupfen, um direkten Kontakt zu den Saiten aufzubauen. “Auch wenn Sie den Bogen in der Hand haben, müssen Sie im Kopf immer mit den Fingern an der Saite bleiben. Sonst verlieren Sie schnell das Gefühl für die Saite, verstecken sich hinter dem Bogen”. Man lernt das Cello neu zu sehen: von der Gitarre her. “Vergessen Sie den Bogen, der ist nicht wichtig!” Von dieser Warte aus lernt Gawehn auch, die Saite nicht einfach zu drücken, sondern zu “fassen”: “Wir müssen unseren angeborenen Klammerinstinkt überwinden. Die Saite mag keine engen Beziehungen, sie will ein freies Gespräch mit der Hand.” Auf Gorokhovs Frage, ob man auf dem Cello zwei Töne gleichzeitig spielen könne, antwortet Gawehn sachgemäss: “Ja, klar.” Daraf erklärt Gorokhov, dass Bogenbewegung und Klang viel runder werden, wenn man nicht flach über beide Saiten drüber streicht, sondern sie – mit unmerklichem Abstand – nacheinander auffädelt”. There are many schools of thought about every technical aspect of playing: posture, positioning, bow grip, shifting, vibrato and so on. But over and above these issues, my main objective is to achieve complete detachment from the many muscular and mental functions required of a cellist during a performance. In other words, I want to make the playing so physically natural that the conscious mind doesn’t have to be involved in any way. Of course, this kind of reflex action is impossible without correct balance and a very solid technique. Let us analyse the way we learn a new piece. First we must understand the structure. Our eyes see notes and our ears hear the music. Next we want to recognise the ‘dance’, like ballerinas learn the steps of a choreography. To play music the body needs certain motions that it learns and the brain catalogues. I want to predetermine the slower motions of my body (particularly the elbows) and store the information so I can later recreate it spontaneously without thinking – totally by reflex. I develop a clear set of tasks that I deal with one by one, so that my brain doesn’t become too overwhelmed. Leonid Gorokhov studied in St Petersburg with Anatoli Nikitin and participated in masterclasses with Daniil Shafran. As a soloist he frequently collaborated with conductor Yehudi Menuhin. He has recorded for Supraphon, Melodiya, Cello Classics and in association with the Bayerische Rundfunk on AGPL. He is professor of cello at the Royal College of Music in London and performs in a duo with pianist Nikolai Demidenko. Once I know the general direction and elevation of the elbows I am free to work out the bowings because my elbow will be at the same height whether I slur of play separate bows. The elbow determines where you are, physically, in the phrase. I can play one separate on a down bow with three slurred on an up, or slur two, four or combinations. Once my body learns the postures I don’t even have to think about bowing and can continuously change or even improvise on the spot because my elbow will always know where it is in the music. Particularly in the Bach suites the bowing is the creative part of interpretation. Intonation is part of this process. If your elbow is in the wrong place it is impossible to play in tune. There are many ways for your left hand to move from the C to the A string, but the elbow has to move ahead of the fingers. If the elbow leads and you have a good hand position, your fingers will automatically fall into the right place. Let’s look at another type of piece like Dance of the Elves by Popper or Rondo Brillant in B minor by Schubert. I practise slowly using long slurs so that I can work out the coordination of the shifts in the left hand with the elbow position of the right arm without having to think about the bow. Everything must remain legato. However, eventually I want to play really fast and, therefore, I have to remember what the fingers are doing and store that information efficiently. When playing I want it to feel like a slingshot: you hold back the elastic band, feel the tension – then release: your fingers fly. Then there is a gap or slot for my brain to catch up and think ahead again. A somewhat analogous situation is finding a way to perform continuous sautillé. I do not play every note the same length – some notes at the end of a group are shorter. I call this bursting sautillé. The stroke is so fast that the audience cannot hear that some notes are shorter. This gives me a chance to rest. If your hand works continuously with many repetitive motions it will become very tired. Make sure the elbow is in the correct position and the bow has good string contact, then make an impulse from the whole arm and relax. This way, through your right hand, like the bouncing of a ping-pong ball, you can create a burst or ricochet stroke. Remember to aim for a fluid, circular motion. Now we must decide on blocks or sections to learn. To find the end of a group look for a change of pattern: a big string crossing or a large shift. The tricky part is establishing where to put a gap before creating a new pattern for the body to learn. Physical movements – not the music – define the series or bursts. Your body asks for a break and then you can go again. When you play slowly listen to your body – it will know how to move more naturally. When the divisions are worked out and the entire structure is formed, then the gaps are tightened and brought closer together. My final objective is that the cello playing will look so good and natural that no one will notice it, including myself – it becomes irrelevant. The Russian cellist Daniil Shafran was totally unconscious of the cello. I saw him in a rehearsal playing the most devilishly difficult music and talking at the same time! He no longer had to control his body. He was free to sense real, powerful emotion, not just text. When your mind is liberated you can become creative. You can begin thinking of more expressive musical possibilities. Your whole being can open to ‘divine’ interpretation. I don’t believe that I have enough in me to create real ‘truth’ in interpretation, but if I free my mind and body I can hope to be inspired by the actual origins of the music.